As the young generations grow up using applications like Facebook and as fans of social networking technologies, understanding the presentations of self in a virtual community becomes a worthwhile topic to be addressed. Drawing on the theory of dramaturgical theory (Goffman, 1959), this interpretive research was conducted to observe the self presentation of the participants in a virtual community to analyze their online behaviors and interactions. The observations found that only in the early stage of interaction, people can have a high degree of control over the ideal images creation; however, the clues to reveal actual images are accumulated over time and across cyberspaces. This research suggested that personal control over image delivery in a virtual community weakens over time, which challenged the assumption made by prior literature regarding how people have greater control in creating ideal images in the virtual community. The findings of this research could provide insight for people who use virtual community to search for credible personal information or to build ideal images. Besides, this research suggested that although Internet technologies facilitate access to a rich source of information, the convenience in information acquisition and verification comes at the expense of personal privacy. A virtual community is not only a space for people to seek information and solve problems, but also a space for them to meet other people, obtain support and build up friendships (Chiu, Hsu, & Wang, 2006). Past studies have mostly suggested that a virtual community can serve as a platform which is especially applicable to construct ideal images. People tend to convey ideal projections of their own images in a virtual community in order to obtain and enjoy recognition and support within the community. Those studies postulated that textual interaction allows more time for people to consider the content they are writing. Moreover, text-based communication in a virtual community is free from social cues embedded in body language, such as facial expressions and bodily movements. Therefore, in a virtual community, people have greater control in creating ideal self images by presenting appropriate texts following a process of thorough thinking. Those confronting these images do not have many clues to identify whether the persons they are viewing in are consistent with their personas in the real world (Bowker & Tuffin, 2002; Dominick, 1999; Ellison, Heino, & Gibbs, 2006; Papacharissi, 2002a, 2002b; Trammell & Keshelashvili, 2005; Vaast, 2007). Contrary to the past studies, this paper argues that only in the early stage of interaction, people have a high degree of control over the establishment of their ideal images in a virtual community. As time goes by, more and more cues are accumulated across cyberspace so that others can obtain a truer picture. As the internet serves functions in regard to searches and connections, the hidden identity and idealized personality of a person in a virtual community can be easily connected to the real world through search engines and cross reference functions. Such background information is fairly helpful for others to understand the scenarios in which a person places himself/herself. It also helps in discriminating the degree of truthfulness of the comments made by a person in a virtual community. Therefore, the image of a person that takes extensive efforts to create in a virtual community may be completely destroyed via an accidental link made by others which reveals contradictions or inconsistencies in presented images. Nonetheless, people usually do not have the corresponding control over factors that violate their ideal personal images. This is an interpretive research and draws on the views of “give” and “give off” in dramaturgical theory (Goffman, 1959) as its theoretical foundation. A virtual community, Mommy’s Circle (alias), is unobtrusively observed and the data analyzed according to three stages of hermeneutic circles, by iterating between the interdependent meaning of parts and the whole (Klein & Myers, 1999; Myers 2004). 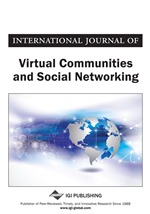 In addition to focusing on thick description of presenting ideal images in a virtual community and the violations of those ideal images, this research proposes an alternative view to investigate the creation and violation of personal images in a virtual community. The remainder of this paper is organized as follows. The next section reviews the “give” and “give off” concepts in dramaturgical theory and the studies related to self presentation in the virtual community and in the other cyberspace. The following section then describes the research setting and method used for data collection and analysis. The findings regarding the creation and the violation of the ideal images in virtual community are discussed, and the conclusion is presented in the final section.